Escape rooms evolve around the concept of teamwork. In order to succeed, you must effectively liaise and work in partnership with one another through various code breaking challenges. Escape rooms will test the strongest of teams, in an entertaining fashion. Our team went to Cryptic Escape Norwich for our team outing not long ago and loved the challenges we had to overcome to reveal the next steps. Go karting is a type of open-wheel car driving ranging in all shapes and sizes. You can race motorless vehicles to high-powered racing machines. They vary in speed, but can reach up to speeds of 160mph. Tracks are places all over Norfolk so you won’t have to look too far to get there. Extreeme Adventure in Kings Lynn is a high ropes and tall trees course that is set at two different heights: low ropes at 20ft, and high ropes at 40ft – for the more extreme participant. There is also a 3G swing. Ten pin bowling is suitable for all ages and is usually twinned with an amusement and bar area. Clay pigeon shooting, the art of shooting a firearm at special flying targets is played at Olympic and amateur level. If your outing is in winter, sources suggest taking a hip flask to keep warm in the midst of a cool field. Hilltop Adventure Centre in Sheringham is a family run outdoor centre that includes facilities such as climbing walls, high rope courses, zip wires and archery. The centre has just introduced the Air Jump, which is the first activity of its kind in England. Highball Climbing Norwich is Norfolk’s first dedicated climbing centre with almost 600m2 of bouldering walls up to 4.5m high. There are various areas including: Roped Climbing, Training Area, Stamina Board and Strength and Conditioning area. 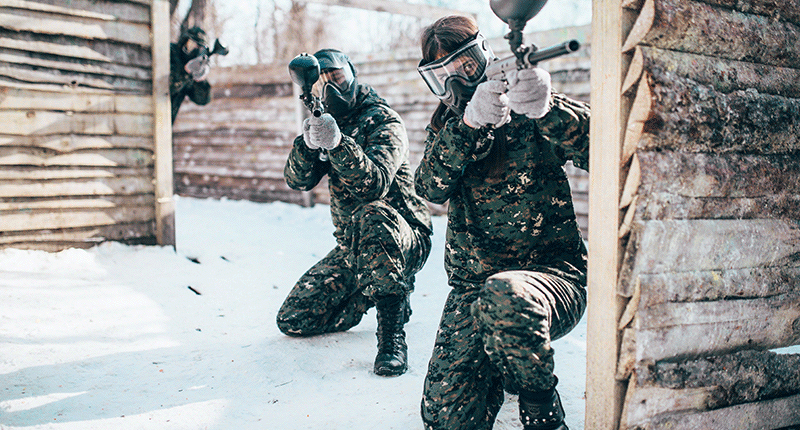 Paintball is a team shooting sport where players eliminate opponents by hitting them with dye-filled capsules. Paintball is more physically testing than mental. You may go home with a few bruises but the excitement will be worth it. Bubble football is when the top half of your body is squeezed into an inflatable ball, and you essentially play football. The faster you run, the harder you will bounce! This activity needs no introduction and is something you can easily organise yourself wherever you are in Norfolk. However if you want a crawl in Norwich, but are not familiar with the best bars, there are organisers in Norwich that offer themed tours.